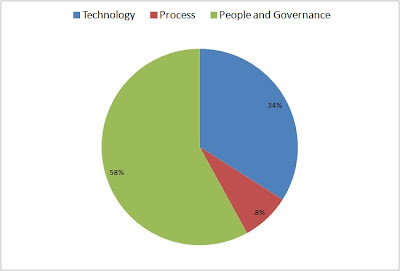 You know how Knowledge Management is often referred to as requiring equal attention to People, Process and Technology? (In Knoco, we add another element and say "knowledge management requires equal attention to People, Process, Technology and Governance). The test of whether you truly believe this, is whether your KM program investments equally in the three (or four) elements. Now this is not as balanced as it could have been, but it avoids the normal Technology Trap. Did it succeed? We are happy to say that this KM program is still very much alive and well and delivering Big Value, 7 years later. A balanced spend certainly seems to have contributed to their success.